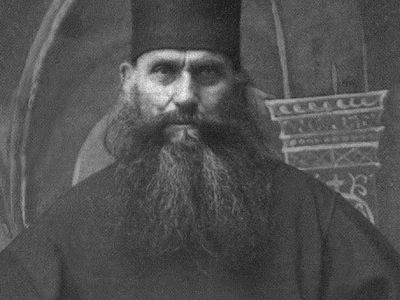 St. Silouan, was born in 1866, of devout parents who came from the village of Sovsk in the Tambov region. At the age of twenty-seven he received the prayers of St. John of Kronstadt and went to Mt. Athos where he became a monk at the Russian monastery St. Panteleimon. He received from the Holy Theotokos the gift of unceasing prayer, and was given the vision our Lord Jesus Christ in glory, in the church of the holy Prophet Elijah adjoining the mill of the monastery. 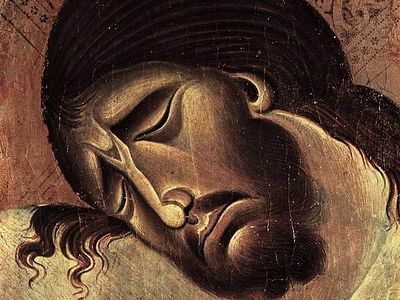 After the withdrawal of that first grace, he was oppressed by profound grief and great temptations for fifteen years, after which he received from Christ the teaching, "Keep they mind in hell, and despair not." He reposed on September 24, 1938. He left behind his writings which were edited by his disciple and pupil, the Elder Sophrony. Fr. 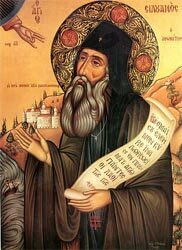 Sophrony has written a complete life of the Saint along with the record of St. Silouan's teachings in the Book St. Silouan the Athonite. The soul cannot know peace unless she prays for her enemies. The soul that has learned of God's grace to pray, feels love and compassion for every created thing, and in particular for mankind, for whom the Lord suffered on the Cross, and His soul was heavy for every one of us. The Lord taught me to love my enemies. Without the grace of God we cannot love our enemies. Only the Holy Spirit teaches love, and then even devils arouse our pity because they have fallen from good, and lost humility in God. I beseech you, put this to the test. When a man affronts you or brings dishonor on your head, or takes what is yours, or persecutes the Church, pray to the Lord, saying: "O Lord, we are all Thy creatures. Have pity on Thy servants and turn their hearts to repentance," and you will be aware of grace in your soul. To begin with, constrain your heart to love enemies, and the Lord, seeing your good will, will help you in all things, and experience itself will show you the way. But the man who thinks with malice of his enemies has not God's love within him, and does not know God. If you will pray for your enemies, peace will come to you; but when you can love your enemies - know that a great measure of the grace of God dwells in you, though I do not say perfect grace as yet, but sufficient for salvation. Whereas if you revile your enemies, it means there is an evil spirit living in you and bringing evil thoughts into your heart, for, in the words of the Lord, out of the heart proceed evil thoughts - or good thoughts. The good man thinks to himself in this wise: Every one who has strayed from the truth brings destruction on himself and is therefore to be pitied. But of course the man who has not learned the love of the Holy Spirit will not pray for his enemies. The man who has learned love from the Holy Spirit sorrows all his life over those who are not saved, and sheds abundant tears for the people, and the grace of God gives him strength to love his enemies. Understand me. It is so simple. People who do not know God, or who go against Him, are to be pitied; the heart sorrows for them and the eye weeps. Both paradise and torment are clearly visible to us: We know this through the Holy Spirit. And did not the Lord Himself say, "The kingdom of God is within you"? Thus eternal life has its beginning here in this life; and it is here that we sow the seeds of eternal torment. Where there is pride there cannot be grace, and if we lose grace we also lose both love of God and assurance in prayer. The soul is then tormented by evil thoughts and does not understand that she must humble herself and love her enemies, for there is no other way to please God. for that Thou hast poured such great mercy on my soul? and dost give them the grace of the Holy Spirit. O merciful God, forgive me. Thou seest how my soul is drawn to Thee, her Creator. and my soul longs after Thee. grieved Thee so often? Yet Thou hast not remembered my sins. Son for the sake of our salvation. and sent His Holy Spirit on the earth. that we may apprehend Thy glory. Although it is natural and usual to love those who love us and to do good to those who do good to us, to love our enemies is distasteful to our nature. One can say that it isn’t in our power but is an attitude that can only be the fruit of grace, given by the Holy Spirit. 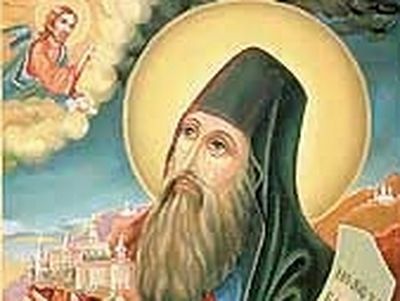 This is why St. Silouan the Athonite writes, "The soul that has not known the Holy Spirit does not understand how one can love one’s enemies, and does not accept it." Here you can leave your comment on the present article, not exceeding 700 characters. All comments will be read by the editors of OrthoChristian.Com. When reposting our material a link to OrthoChristian.com is required.